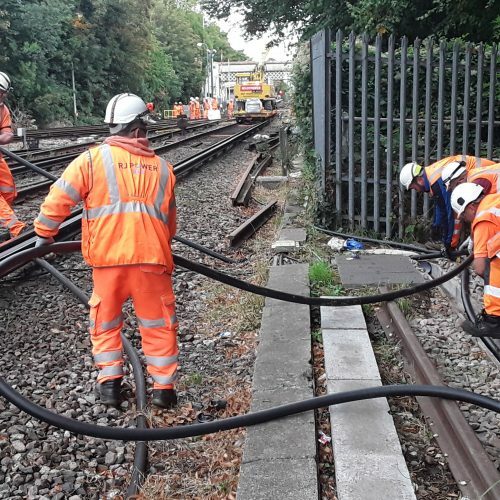 We are delighted to announce that as part of our ongoing Safer Isolation contract with Network Rail Wessex, RJ Power Rail has had a successful weekend installing Controlled Track Switches (CTS), cabling and Cable Management Sleepers (CMS) at Strawberry Hill. The team delivered and installed 6No Cable Management Sleepers, 260 metres of 1000mm track feeder and lugged and terminated 16No 1000mm track feeder cables in under 6hrs. This precise planning and delivery are what leads to the safe delivery on-site, every time and is testament to excellence of the RJ Power Rail delivery team. These works form part of a significant contract awarded in March 18 for the design and installation of 30 Control Track Switches (CTS) in the Wessex Area. The renewal is condition, reliability and safety driven and is supported by NR fault data and E&P Asset Policy. The works are a continuation based upon the CP5 E&P Works Delivery Renewals Programme. The CTS devices being installed form a new safety feature and method of managing power to the conductor rail system which is fed from traction substations at 750V DC enabling activities to be implemented from a position of safety (Electrical Control Room) and not from on or near the line position. RJ Power Rail are providing a fully managed design and build solution, self-delivering all installation, test and commissioning works, and are managing the design works through long-term supply chain partner (Rail Power Solutions).